Has DC Comics gone nuts this March, 2015! 'Why', you may ask? Because they're re-releasing a lot of classic movie styled covers! Who could forget Bruce Wayne’s soul crushing performance as a fugitive in, 'BATMAN / SUPERMAN'? Or how about the movie that revolutionized the martial arts genre, 'Cracking the code of SPIRAL'? So, knowing that it was something he could never miss, Scott Lobdell asked his two good pals, Tom Derenick and Sean Parsons, to join him on a three day movie marathon at his local theatre. Bless em. This is it, boys and girls, this is the final fight for Earth’s survival. In the red corner, we have the dashing, intrepid, and incredibly good looking; THE OUTLAWS! And in the blue corner, looking to destroy everything good, and making us wear ridiculous hats; HELLSPONT AND THE CITADEL! Who will win? Let’s find out! Shall we? 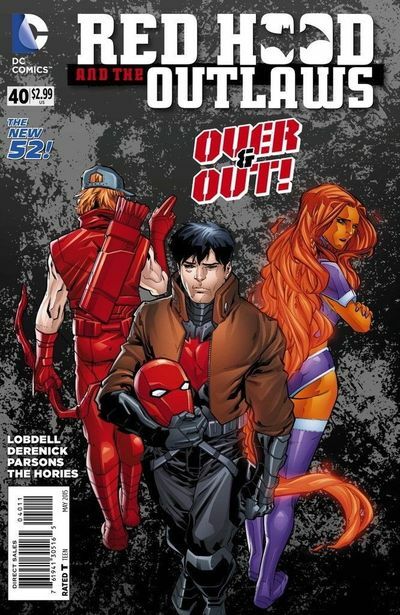 With this issue Lobdell ends his run on the Outlaws. Now that doesn’t necessarily mean that his story is going to be melancholic and depressing. It is, in fact, the opposite: filled to the brim with action and leaving a pleasant impression of being just a hiatus for the characters and not an actual end. All the plots seeded over the last few months (or even longer in Hellspont and Komander’s case) have a satisfactory conclusion, from Crux putting his intelligence to good use, to Rose being that friendly shoulder for Jason to rest at the end, everything and everyone has a role to play. It is important to highlight that Hellspont’s attack is just a frame of reference for the true core of the story: how the outlaws have grown through their adventures together. Jason has finally let go of his traumatic past and is able to see life with a renewed outlook, filled with hope for the future. Roy has found a place to belong and the will to keep going despite the obstacles life will throw at him. And Kori came to terms with her past, mending her relationship with Komander in the process, and she’s ready to meet and accept other people in her life. And speaking of Komader, we finally get a satisfactory explanation about her actions. She was helping Hellspont out so she could free Tamaran, but she was never on his side and thus, when the opportunity to get revenge presented itself, she took it. The consequences of her actions are dire and ultimately the reason for the Outlaws disbandment, however, it feels organic and not unnecessarily dramatic. The final two pages of the issue, giving us the final scenes of the team, perfectly represent what the series was all about, and leaves us with a pleasant bittersweet aftertaste. Excellent work, Mister Lobdell. Excellent work. The adventure was packed with so much stuff that we don’t have the luxury to let every event sink in. At a very frantic pace we go from plot point to plot point the overal experience can turn some people off. This could’ve been fixed by either having a bigger issue or culling some plots, mainly, the Rose Wilson one. In the end, her involvement was minimal and she could’ve been removed without affecting the narrative, thus, giving more space for the story to develop. After looking through many-many songs about new beginnings, 'I’m Still Standing' by Sir Elton John is my top pick for this comparison. The Outlaws are no more, but Jason will keep going. It's not the first time (and certainly it won’t be the last) he will have to start anew. A chapter in the life of our heroes has been closed. 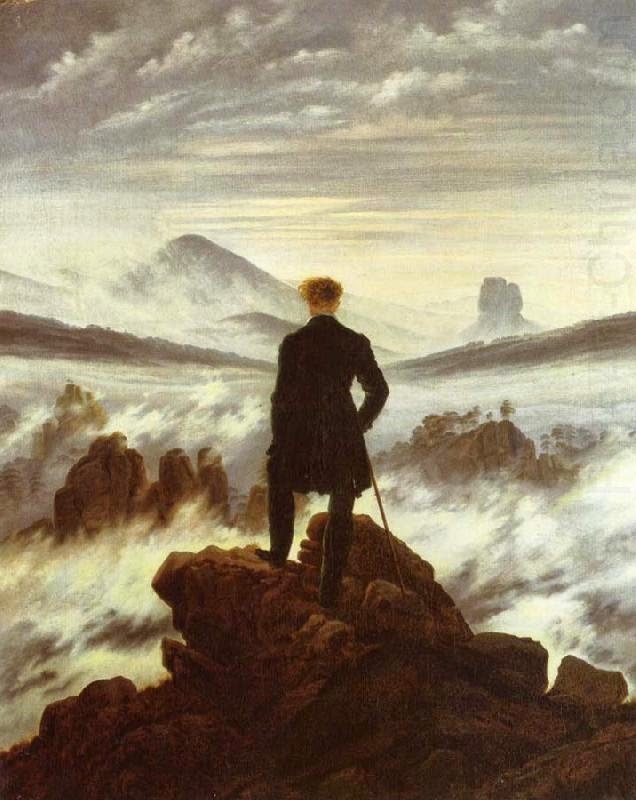 Now they look out at all the opportunities they have for their next adventure, just like Caspar David Friedrich’s, 'The Walker Above The Mists', contemplating the scenery before choosing his next destination. 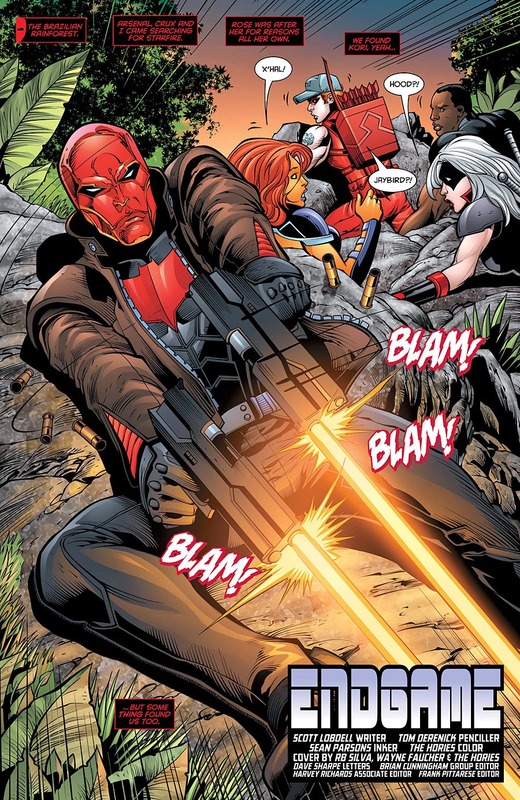 Red Hood and the Outlaws was always a controversial book, one of the few completely new titles to arise from the Flashpoint reboot. It has had to fight an uphill battle against the critics, the scepticism of the readers, the poor reputation of its protagonists, and of the writer. And yet, against all odds, the book thrived and prospered under Lobdell’s skilful pen. The characters managed to find a new voice and direction that sets them apart from their previous iterations, earning them a place within the larger DCU. But more importantly, the book has found one of the most passionate and committed fan bases in existence, the same fan base that gave its full support even after very questionable editorial choices, terrible change of writers, lack of a stable artist, and relentless criticism. A book, I might add, that has a very simple message: You’re not defined by your past; you can always rebuild yourself up, no matter the circumstances, forge new bonds, and find new goals in your life. Yes. It was a wild ride. God speed Outlaws and thank you Scott Lobdell for giving us a great and funny story about three friends helping each other to be better. 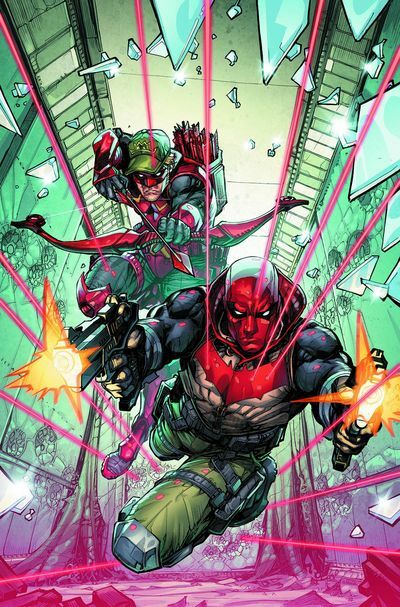 I hope you guys will be back with me in June to see what’s next for Jason and Roy on their new title, 'Red Hood / Arsenal'. I’m sure it'll be a blast. *** This review was brought to you by Adan, Comic Lad Extraordinaire.